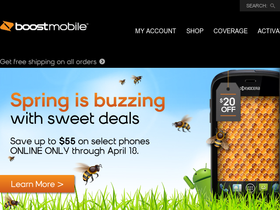 Go to Boost Mobile, online at boostmobile.com, for wireless phones and services with no long-term contract. Boost Mobile is one of Sprint's pre-paid brands, and is dedicated to satisfying customers' desires in a wireless company. Boost Mobile offers monthly unlimited plans, and offers phones from LG, Samsung, Motorola, Sanyo, Blackberry, HTC, and ZTE. Boost Mobile makes it easy to enjoy plans like Android Monthly Unlimited, and others without contracts and activation fees. Before you shop, get all the latest boostmobile.com discounts, Boost Mobile promotions, and Boost Mobile coupon codes found here at RetailSteal.com. Boost Mobile offers free shipping on all purchases. See site for coverage information and details. Shop at Boost Mobile and enjoy $90 savings on the HTC EVO Design 4G. Click here to shop. Shop at Boost Mobile and enjoy $50 savings on the HTC One SV + $100 credit when you switch and use this promo code today. Shop at Boost Mobile and enjoy $35 savings on LG Venice. Click here for code. Shop at Boost Mobile and enjoy $25 savings on activation and first month. Click here for code. Save 10% on All Certified Pre-Owned Phones plus an extra $100 credit using this coupon code when you switch to Boost Mobile. Get started now. Get free shipping on all orders from Boost Mobile. Click here now to enjoy pre-paid service on phones from Samsung, LG, Blackberry, and others. Get the Blackberry Messenger unlimited monthly plan, starting as low as $45 per month from BoostMobile.com. Click here an enjoy this contract free deal. Get Talk and Text Unlimited from $50 from Boost Mobile. Enjoy no contract with this special offer. Get the Android Monthly Unlimited plan, starting from $55 from Boost Mobile. Click here now to start. Boost Mobile offers monthly plans, pay as you go plans, and daily plans with no contract and no credit check. Click here to start. Use our Halloween coupon code at Boost Mobile now to save 10% on any order for a limited time.